First recognized as the basis of Bitcoin and other cryptocurrencies, blockchain may change the relationship among colleges and universities, providing a globally distributed network for securely sharing resources and records, including student transcripts, degree information and other data. 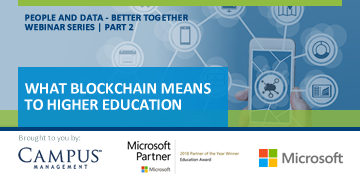 How might blockchain innovations positively impact your institution? As Principal Architect for Product Development at Campus Management, Mr. Phelps focuses on front-end technologies across the higher education enterprise, specializing in the design, building, and management of cloud-based, innovative solutions. Having worked professionally across platforms for over twenty years, he specializes in solutions development with agile teams in product-driven institutions and organizations.